SEATTLE - Feb. 18, 2014 - PRLog -- Pick2Pay 2.1 is now available in the App Store with an abundant sprinkling of iOS7 beauty. Pick2Pay now lets you see your stacked rewards on the results page very easily. 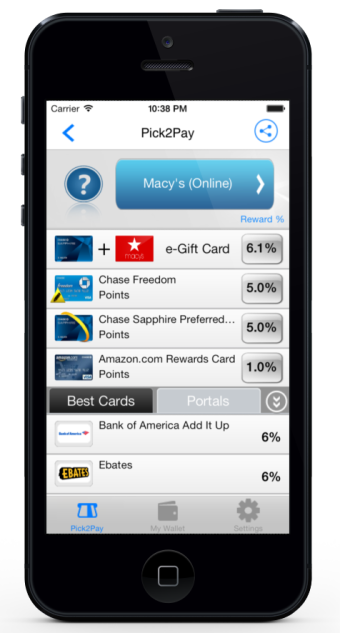 You can see the shopping portal that stacks on top of your credit card rewards to make the rewards look smart. You click on the link and shop through the portal ansd earn the most points, miles or rewards. Pick2Pay is your juicy sandwich of savings for every purchase- be it credit card rewards, shopping portals, discounted gift cards or offers and coupons for stores around you. There is a lot of savings on each screen. Click on the ? icon to see screen overlay of all the details of each page. On the map page you can click on the legend to see the various color pins and the types of offers these pins represent. As always you can compare their savings and cashback from over 20 different shopping portals for shopping online. For Eg: You can choose to get 6% for shopping at Macy’s by going through Bank of America Add It Up or get 6% by going through Ebates® . Users can now choose from shopping portals like Ebates®, MrRebates® beyond credit card and airline shopping portals like ShopDiscover®, Bank of America Add it Up®, Delta Skymiles Shopping® etc.